Here is a cheeky little dessert for the grown ups. In essence, it is a vanilla pannacotta with a coffee and Frangelico syrup. I am a big fan of pannacotta. It takes minutes to make, can be made the day before, is fail proof, tastes absolutely fab and looks real posh. When I was contemplating making Maggie Beer’s baked vanilla custard with coffee jelly for friends, I searched for a coffee dessert in Eat Your Books and narrowed down the results to two. I ultimately decided on Maggie Beer’s recipe but I still had this guy at the back of my mind. So when next an opportunity presented itself, Pannacotta Affogato it was. Just one note. The coffee syrup is very sweet so watch how much you give each person. The recipe is by Valli Little. It appeared in the May 2010 edition of Delicious Magazine. 3 gold-strength gelatine leaves (I don’t really understand the classification of gelatine leaves. I used 10g of ordinary gelatine leaves and found the pannacotta to be a little firm. Next time I will use 8g. Read the instructions on the pack of your leaves and err on the size of soft rather than firm: you do not need to turn this pannacotta out. Place cream, milk, sugar and vanilla pod and seeds in a saucepan over low heat. Stir to dissolve sugar. Bring to just below boiling point, then remove from heat and stand for 15 minutes to infuse. Soak the gelatine leaves in cold water for a few minutes to soften. Gently reheat the cream mixture over low heat. Squeeze the gelatine to remove excess liquid, then add the leaves to the cream and stir until dissolved. Cool slightly, then strain and pour into six latte glasses. Place coffee and sugar in a small saucepan over low heat and stir until the sugar dissolves. Pour the coffee syrup over the pannacottas just before serving. Top with roasted hazelnuts or chocolate coated coffee beans or a hazelnut chocolate – all would be glorious. Serve with a wee glass of Frangelico. This entry was posted in Cold desserts, Desserts and tagged Affogato, Frangelico, Vanilla pannacotta by Glenda. Bookmark the permalink. could not buy gold leaf gelatine for love nor money until found it in the deli at the Sydney Fish Markets (obvious place to look for it I know but…) will try this recipe using gold leaves of gelatine, sounds very yum. Just back from the snow and -13 wind chill, lucky you having a heat wave. Sorry, it’s been so long but I’m finally catching up slowly with my blogging friends. This was the first one I looked at and I think it’s just what the doctor ordered! Okay, maybe he didn’t exactly say “you should have Frangelico”, but I do love a little sip now and then. The operation was very successful and I was only in the hospital for 3 days. I have a nurse and physical therapist visit me twice a week and was doing so well with PT that when we had a beautiful day, I took my walker, called Lola, and went for a walk up the street and around our cul de sac. Well I guess I overdid the exercise and ended up loosening the joint and back in bed for a few days until it calms down. It’s just silly little exercise that doesn’t seem like much but I guess after a year of not walking, I don’t have the muscles to support the joint. I’ve learned my lesson, frustrating as it may be. Oh I’ve learned my lesson, that’s for sure. I feel so bad for Lola though – she has to be bored out of her mind – no walks and no car rides! Hi Patti, Good to hear from you. Enjoy your fish. 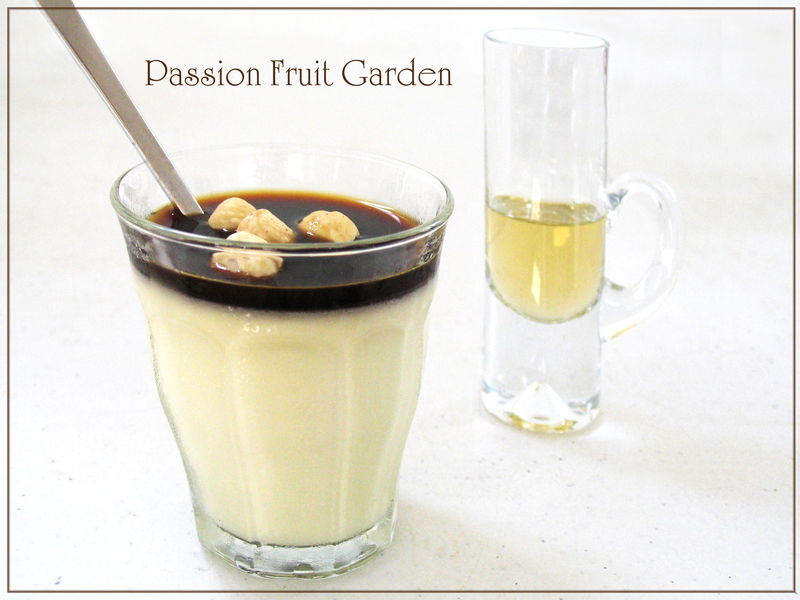 Hi Ella, this is my very favourite pannacotta https://passionfruitgarden.com/2012/03/24/buttermilk-panna-cotta-with-cumquat-sauce/ Use what ever syrup you like, coffee, chocolate etc and you will have a magnificent dessert. As you can see, you can mould them or leave them in little glasses. Good on you. You will find they will become your new dinner party dessert as they are so simple and you can prepare them the day before. Hi Jane. Pretty good – I do like Frangelico. In a word yum. I could make a meal around the dessert. It would make a perfect finish. Thanks. Hi Lona, I love it as it is so simple yet would look the part at any dinner party. I’m a big fan of Frangelico. Nice. Hi Mary so am I. It is just lovely. Hi Sandra. I will check out Stephanie’s explanation now. Hi Sandra, Just checked it out. She doesn’t talk about gold leaves and titanium leaves and ordinary old leaves. I think you just have to read the packet and make a stab at it.